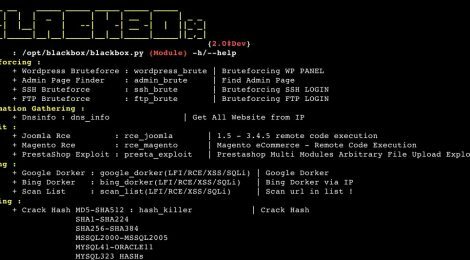 Browse: Home / BLACKBOx v2 – A Penetration Testing Framework. + ADD XSS/SQLi/RCE Scanner to google & bing dorker module ! ← POOFITEE v0.0.1 – Linux Scripting “Perfect Owner Only Firewall – Invisible To Everyone Else”.